Love sugar cookies, but hate all of the work rolling, cutting and decorating? 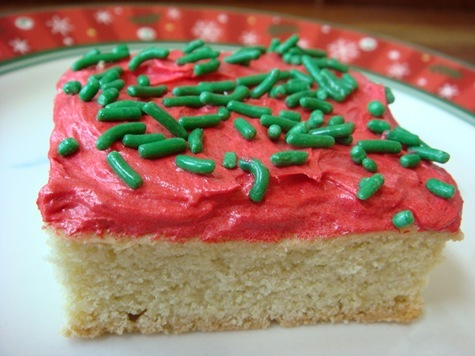 These sugar cookie bars are the perfect substitute. The dough makes a thick, soft sugar-cookie-flavored bar cookie that you can top with your favorite icing and fun holiday sprinkles. These are topped by one of our favorites, a cooked vanilla frosting. In a large bowl with an electric mixer, cream butter and sugar until fluffy. Add eggs, one at a time, mixing after each egg. Mix in vanilla and almond extract, if using. In a separate bowl whisk together flour, salt and baking soda. Add to wet mixture and mix just until combined. Spread on a greased, rimmed baking sheet (you can use either a 12×17” pan for thinner bars or a 10×15” pan for slightly thicker bars). Bake: 10-15 minutes for a 12×17” pan or 15-20 minutes for a 10×15” pan, until light golden brown and a toothpick comes out clean. Cool completely before frosting. Frost with desired frosting and add sprinkles, if using. Refrigerate the bars until firm… it will be easier to get nice, clean cuts.